The Fairland Boys Gymnastics Team is a USA Gymnastics (USAG) competitive program that we have designed around overall fitness and skill development. Our coaching staff does this in a safe, positive, and challenging environment. We have athletes at all competitive levels: compulsory (levels 4-7) and optionals (levels 8-10). The team practices from 2 - 5 days a week, or 6 - 25 hours, depending on the level. Every year our athletes compete in local qualifying meets, sectional, state, regional, national and invitation only meets. New families join the team by invitation. A boy may come to the attention of the coaching staff through his performance in a recreational class, or a parent might request a try out. The coaches will assess of the student's ability and potential by inviting him to attend one or several practices with the group level he would most likely join. As well, the coaches will take into account the current size of the team roster. Team spaces are not automatically retained from one season to the next. Once on the comptetive team, the gymnast's progress and development will be reviewed annually. Final decisions regarding team program placements are made by the Program Director and Team Head Coach based on participation, acheivement and attitude, and are subject to approval by the Gymnastics Director. Which team members that are selected for competitions, special teams, extra practices and special events are at the discretion of the Program Director. Our competetive team are members of the USAG, subject to its bylaws and codes of conduct. We are part of USAG Region VII, which spans approximately 300 miles throughout Delaware, Maryland, New Jersey, Pennsylvania, New York, Virginia, and West Virginia. Most gymnastics meets in which Fairland competes are within the state of Maryland and are governed by the USAG Maryland Men’s Junior Olympic Gymnastics Program. Higher-level gymnasts may also compete in invitational meets out of state. The Developmental Team is the feeder group for the competetive program. Members of the Developmental Team have more practice time than students in the recreational clases, but do not compete. 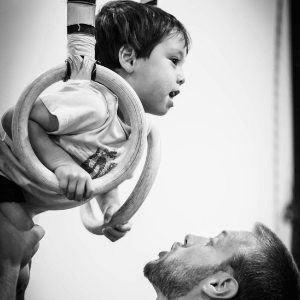 The Hot Shots class is typically for 3-5 year old boys, and the D-Team is typically for 5-7 year old boys. Older boys identified from the recreational program are also sometimes invited to D-Team. Both Hot Shots and D-Team gymnasts demonstrate their skills at the end of each May during Fairland's annual Spring Fling. Before a student can register for Hot Shots or D-Team classes, the coaching staff must agree that there is room in the class and that the student is ready for the pre-team program. Hot Shots is a one-hour class that meets once a week. Hot Shots focuses on strength, flexibility, and skill development to prepare the boys for progression into the D-Team, while retaining the fun needed to encourage and motivate young boys. Hot Shots do not compete, but they get a more focused introduction to the men's apparatus than do boys of the same age who are in recreational programs. D-Team is essentially Pre-Team, however at this level there is no competition. Hot Shots and D-Team learn skill progressions, instead of competition routines and only perform publicly at Fairland's Spring Fling exhibition for parents at the end of May. D-Team boys practice twice a week for 2 hours each practice. At the end of each Spring, the coaches will provide parents with a formal evaluation of their child's progress and recommend the level to train starting in the Summer. At the end of Summer, the coaches conduct another informal assessment and make a final decision on the athlete's level for the upcoming Fall competitive season. Boys Bronze Ages 5-7: Basic Instruction on vault, bars, pommel horse, parallel bars, rings, tumbling, and trampoline. Boys Bronze Ages 7-10: Basic Instruction on vault, bars, pommel horse, parallel bars, rings, tumbling, and trampoline. Boys Silver and Gold Ages 7-12: Must have completed Boys Bronze Level or demonstrate select skills on aparatus. Floor: forward and backward roll, cartwheel, round-off, handstand roll. Horizontal Bars: cast, pullover, back hip circle, 3 pull ups, and 3 tap swings. Parallel Bars: upper arm support swing and straddle travels. These classes are also designed to find boys with the talent to join the competitive program. Instructors may offer the opportunity to try out for the pre-team/team. Assessment is based on a gymnast’s strength, flexibility, skill level, and desire. For more information about how to register for a recreational class, visit the PG Parks website. For more information about the Fairland Boys Gymnastics Competitive Team Program please contact us.